When the Giants won their World Series championships dating back to 2010, one of the team’s signatures was a formidable starting rotation and bullpen depth, highlighted by guys like Tim Lincecum, Matt Cain, Ryan Vogelsong and, most recently, Madison Bumgarner. Aside from Bumgarner, however, the shelf life of these starters has been underwhelming, as Lincecum transitioned from a Cy Young candidate to a risky signing over just five years and Cain has had trouble reclaiming his dominance. That leaves Bumgarner who, if it weren’t for unbelievable seasons from Jake Arrieta, Zack Greinke and Clayton Kershaw, would have probably gotten more attention for his impressive 2015 regular season than he did. There are no clear answers below him in the starting rotation, which has made the front office very active in pursuing second-tier starters. They tried filling this hole last offseason with Jon Lester, but the Cubs won that bidding. San Francisco had better luck this time around, signing Jeff Samardzija to a five-year, $90 million contract and one can assume, at this very moment, he will be the number-two starter behind Bumgarner. Here are three takeaways for the signing. As I stated in the introduction, San Francisco has been looking to lock up a second-tier starting pitcher for quite some time now. They reportedly went hard on Zack Greinke before he signed the absurd contract Arizona offered him and, like with Jon Lester last offseason, lost out again on bringing in a second ace to pair with Bumgarner. Jeff Samardzija clearly overshot his own value when he turned down a five-year, $85 million deal from the Cubs in 2014, as he’s not making much more now with the Giants. An 11-13 record, 4.96 ERA and 4.31 xFIP during a contract year will bring down anyone’s value. Now, the Giants could spend on a guy like Wei-Yin Chen and this contract might make more sense, but if the Giants are investing their faith entirely in Samardzija despite a really bad 2015 season with the White Sox (and, really, an underwhelming career), they could be in trouble. The first takeaway looks at all the negatives to this signing, but that isn’t to say there aren’t positives. 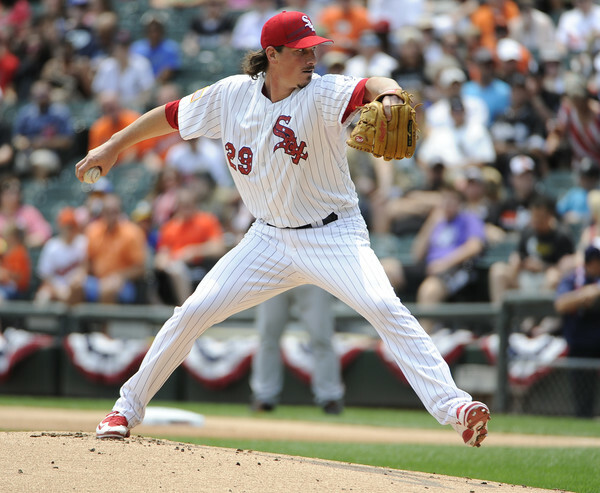 Samardzija threw 214 innings despite his struggles on the South Side, and pulled together a 3.28 strikeout-to-walk rate. His groundball rate went down a whopping 11% last season, but his home run-to-fly ball ratio didn’t change from career averages. What does all of this mean? San Francisco has a notoriously spacious ballpark where a higher fly ball rate may not be the worst thing in the world. He just needs to avoid line drives to that black hole in right-center field. If Samardzija can keep striking guys out, log a significant amount of innings and limit line drives while keeping his home run rate at a career average, this contract can work out. His profile indicates this could be a decent fit. Even if Samardzija develops into the pitcher a lot of people think he can be (entering his age-31 season, that window is getting smaller and smaller), he’s not enough to make the Giants better than their NL West counterparts. While the Dodgers lost Greinke, one has to imagine Andrew Friedman has a handle on where to take his team, and things will be just fine in Hollywood. Arizona proved their seriousness by signing Greinke and has the pieces to contend. San Francisco, on the other hand, seems stagnant, and this shouldn’t be concerning because it’s not like they won three World Series championships in five years by selling the farm in blockbuster trades and spending big on free agents. However, the pieces don’t seem to be there at this moment in time; they still have Buster Posey and Hunter Pence, but the latter is getting older with every passing year. Best-case scenario, if Samardzija logs 220 innings for the Giants with a sub-three ERA in 2016, I’d be surprised if that was enough to propel San Francisco to the top of the West or even the NL Wild Card. They have also surprised me before.